Navigating the complex world of ACA healthcare benefits can be a daunting task for any business owner or HR professional. And understanding the detailed legislation is only the first step to staying ACA compliant. But there are a few strategies that will help employers avoid large fines and ensure they always offer healthcare benefits to exactly those who qualify. Once you’ve determined if your business is an ALE (applicable large employer), the next step to staying ACA compliant is identifying which employees are eligible for health benefits. There are multiple methods for determining ACA eligibility, and all have their own sets of advantages and disadvantages. 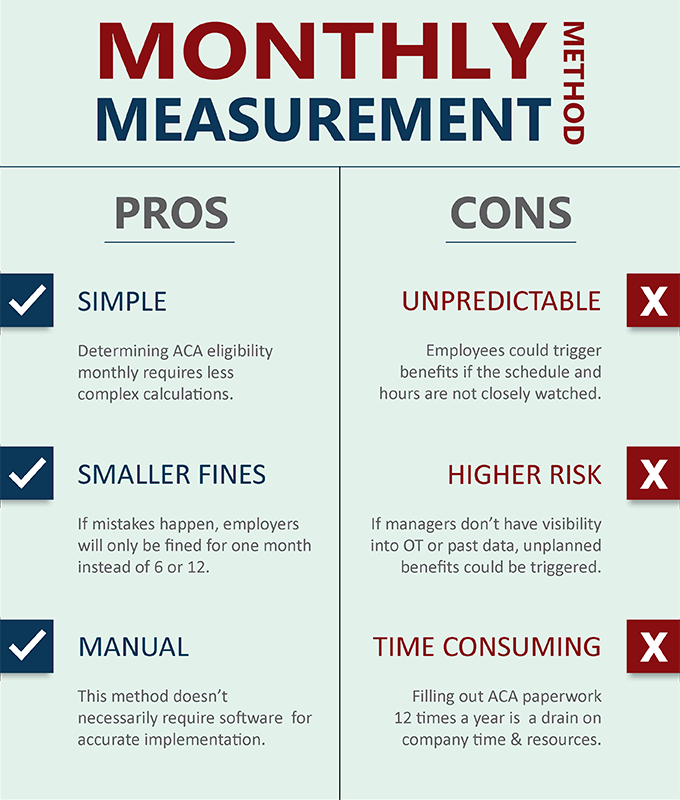 With the monthly measurement method, employers assess ACA eligibility on a month-to-month basis. This means an employee’s eligibility for health benefits for the upcoming month is dependent on the number of hours they worked the previous month. But how many hours is considered full time? There are a few ways to count. With the weekly rule, employers calculate certain months based on a consecutive five-week period, with the fifth week including either the first or last day of the month, but not both. When calculating full-time status over a four-week period, employees must exceed 120 hours of work to be considered full time. When using a five-week period, employees must exceed 150 hours. The monthly measurement method is considered the default among many businesses, and is the simplest to implement in that it doesn’t require complicated calculations. And if mistakes happens, employers will only be fined for a single month, rather than the whole year. While this method does have simplicity on its side, it also has a lot of potential risks for employers. For one, it’s unpredictable. Employees could trigger benefits one month, but not the next, making paperwork and budgeting a guessing game. And if there’s not enough visibility into employee schedules and overtime hours, managers could inadvertently allow employees to hit overtime and trigger benefits. Employers who elect to use the monthly measurement method may not need to buy software to accurately assess eligibility, but they will inevitably have to spend hours every month calculating employee time and attendance and administering and submitting paperwork. For businesses without a dedicated CPA, all of this paperwork and administration will have to happen in-house, eating up valuable company resources. Alternatively, businesses can pay a CPA to assess ACA healthcare eligibility, which is less draining on company time, and is oftentimes more accurate, but with CPA rates ranging from $100 - $200 per hour, employers will rack up big bills every month just to stay ACA compliant. The measurement period is used to determine ACA eligibility for a specified, future period, known as the ‘stability period.’ The stability period must be at least six months, or the length of the measurement period. This means if your measurement period is three months, your stability period must be the minimum of six months. But if your measurement period is 10 months, your stability period must also be 10 months. The look-back measurement method has a few key advantages. For one, it saves employers time. Rather than determining ACA eligibility every single month, business owners can do it once or only a few times per year. That’s why many employers who elect to use this method use a full 12-month measurement period to limit the administrative burden to once a year. 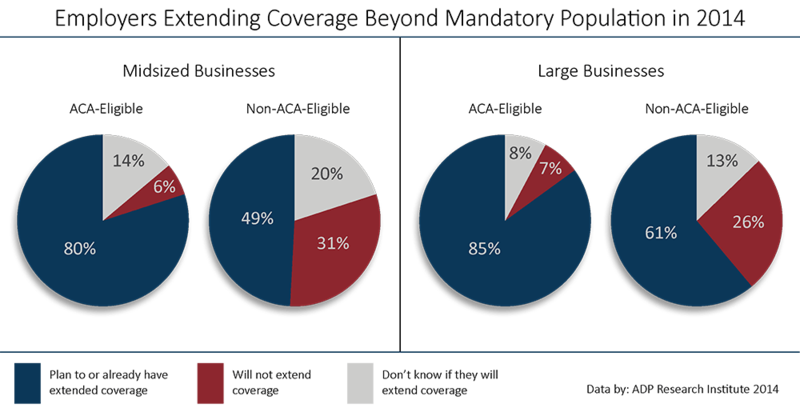 Assessing ACA eligibility in larger chunks also helps for more predictable budgeting. Employers will know exactly how much they’ll spend on ACA health benefits for employees yearly, bi-yearly or quarterly. This method also has a few key disadvantages when not administered properly, including a higher risk of bigger fines. In the case of mistakes or miscalculations, employers will be hit with fines for the span of three, six or 12 months, rather than just one. Administration can also be tricky when multiple measurement periods overlap due to new hires joining the workforce midyear. 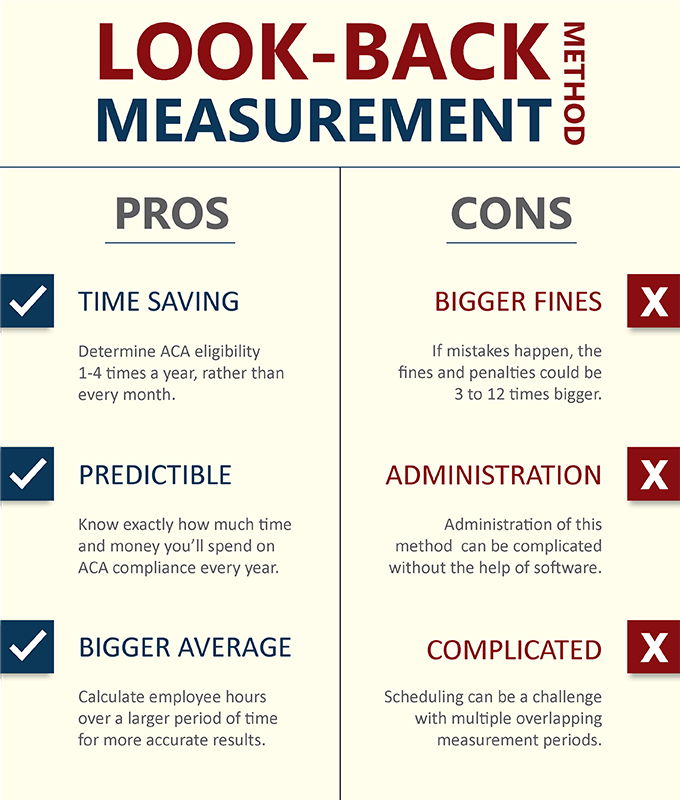 But with the help of ACA reporting software, the look-back measurement method can be easy, accurate and cost effective. A third option is to bypass the counting and the numbers game, and simply extend coverage to all of your employees. While it may seem counterintuitive to pay more for health benefits than is legally required, a surprising number of businesses are doing just that. According to a report by ADP Research Institute, almost 50 percent of midsized businesses and over 60 percent of large businesses said they planned to or already had extended coverage to non-ACA-eligible employees in 2014. Because for many businesses, the advantages of extending health care benefits to all employees outweigh the costs. For one, it completely eliminates any guesswork. Employers don’t have to worry about employees triggering benefits from month to month when they already plan to extend coverage to all workers. And that makes for easier, more predictable budgeting. It also helps attract top talent. And according to the ADP RI report, about 75 percent of both midsized and large businesses that extended coverage beyond the mandated population said they did so to entice those star workers. Regardless of the method you use, staying ACA compliant can be challenging for any business owner. For more information on ACA compliance and resources to help your business stay on top of changing legislation, download our ACA Compliance Guide for Employers in 2018.